Dusko Vujosevic has become our team’s new head coach. The Montenegrin coach signed a 3-year contract. Vujosevic started his career at the age of 17 with Partizan Belgrade junior teams. He was named black-and-whites head coach in 1985 for the first time and won Yugoslavian championship the same season. His team won the Korac Cup in 1989. He changed clubs several time after that with stints at Granada, Brescia, Pistoia, Scavolini, Crvena Zvezda and Radnicki. He returned to Partizan in 2001 to win 9 Serbian Championships in a row and 4 Adriatic League titles. He was the Serbian National Team coach during Eurobasket 2003 campaign. 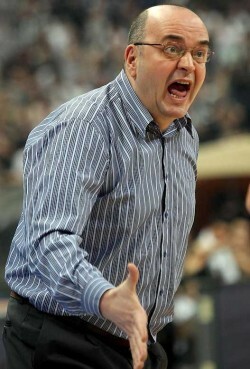 Vujosevic was named Alexander Gomelsky Trophy winner as the best Euroleague coach of 2008-09 season. He took Partizan back to the Euroleague Final Four in 2010 after a12-year pause.